The local WM depot had this Superliner in their kennel back in 2014. Looks as though it was assembled yesterday Bob. .
Actually White just revived an old concept that hadn't been dead all that long, for example International offered an integral sleeper on the Emeryville conventionals in the 60s. Proof that Volvo copied American truckmaker Ford to create their "Integral Sleeper". Since you have two 359's now, it is officially a collection! Mine is a 1969 Brockway E359T (671 and a RT-910). Great video kind of surprised the UP wasn't in it. I've got to say that is pretty cool and looks to be well done. R model cl lamps not working. Got it all figured out. A friend printed me out the wiring diagram on a massive printer. Turns out the previous owners had the wires run differently and they also had the wrong style switch in place. All back together everything working. funny thing is, if you show that picture to people they think it is my nephew. we bust his chops that all he has to look forward to when getting older is looking like me. What are you’re plans for the truck? And for sure, nothing wrong with the alternator! 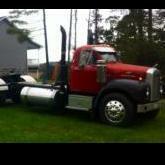 Yeah, it doesn't look all rusted out like a lot of the steel cab trucks! Good find. The expansion tank and radiator are considered chassis items so 1 year/100,000 miles from in service date. You can buy extended chassis warranty. The fleet I work for now has extended chassis warranty on all the Mack’s. Covers about everything but tires, bulbs, belts, brake shoes and clutches. You will usually go through 2 turn signal switches , a radiator and 2 expansion tanks, a chassis wiring harness and various ABS sensors under the extended chassis warranty. Not a lot of C-Model Dodge survivors. 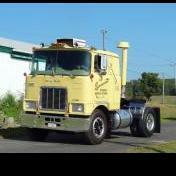 I always wondered why Doge used the 6-71 Detroit Diesel with blower on drivers side I think IH 2070 used same setup.Good luck on the sale.If anyone remembers M+G Convoy out of Buffalo New York they had the best running 6-71 Detroits in Dodge C-900's.It had to be their mechanics as we ran some 6-71 Detroits in the 1970's and they always passed us like a freighttrain passing a HoBo. Joe D.